Strathwood's Rawley dining table is a great place to eat out on the patio with friends and family. Designed to withstand the elements, the table is made from the highest grade of aluminum, sand casted, and covered in a brown powder-coat finish to protect against rust. 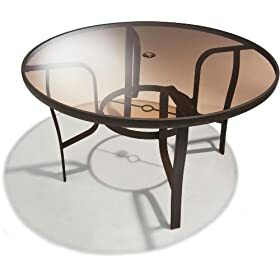 Measuring 27.5 inches high with a 48-inch top diameter, the table features an umbrella hole in the center for easy, comfortable entertaining in the rain or sun. It weighs 43 pounds and requires some easy assembly on arrival. For a gorgeous, accessorized look, pair the table with matching Rawley sling dining chairs. Shop the complete line of Rawley outdoor furniture to create a more fashionable and functional patio retreat.